I work a full day on Tuesdays. But usually I work from the office. I was asked to be in the office on Wednesday, so I decided to stay home today and work. But, since I have the four kids with me due to co-parent’s work trip, today was quite unusual. I woke up to little pitter pat steps through the kitchen and into my room. Twin Husky was great and slept all night in his bed and made it into mine shortly before the alarm rang. He had his duck with him. He had his duck kiss me. I kissed the duck back. I kissed him. He smiled. He kissed me back. We called each other by our names. We tickled. I love waking up like this. I got ready quickly. Twin Husky found my feminine hygiene products. He’s extremely talkative and we have conversations all the time. He of course asked what those were for. I said they were for women. “Not Daddy?” “No, not Daddy”. “Only for women?” “Yes, only for women. Like mommy.” “Oh. I didn’t know that you’re a woman.” Thanks Twin Husky. Thanks a lot. I decided to honor the Chocolate Tuesday tradition. It was a quick breakfast. Thank goodness since we were running late. The outside bus came and went… all of us missed the neighborhood kids. Now we know we’re really running late. Lunches, getting dressed, combing hair, getting shoes, getting in the car…. off we go! Drop off was great for Red and Big Bro. I forgot to mention yesterday that their school is about 2 miles from my house. Co-parent bought a house about a mile away from that school. So we’re finally all close, and now able to settle. I am able to breathe so much better now. Writing about it also makes me feel so much better. These kids are able to root. They are able to grow up with their friends. We know what school they are going to. We know what middle school they will go to. And High School. This is the best school district around, with somewhat affordable housing (all is relative). I did the absolute best that I could do as a single mother, four kids, working part time. I still can’t believe I am able to pull this off. It does not come without its sacrifices though. But I am getting used to this way of living. Twin Crazy, Twin Husky, and I met the nanny back at my house. I was not sure if I was going to have my car today – the plan was for her to take care of the kids at co-parent’s house since I was going to work from home. She would use my car. So, I took the opportunity to go food shopping to buy a roast. I felt like taking advantage of working from home, and also for this extra time with the kids. Twin Crazy and Twin Husky had fun in their “car cart”. I dropped them off at co-parent’s house. They didn’t want me to leave. I gave them piggy back rides. They gave me kisses. They watched me drive off. I honked the horn for them. I had much more coffee and got at it. A few conference calls, lots of emails, some re-working of presentations. Planning for some transitions. I’ll be taking on more work but hopefully we will be hiring good resources on the data side of the job to free me up for client management and planning. During breaks I started the roast, did some dishes, took down the trash, enjoyed the sun. I picked up Big Bro at 2:30. The rest of the kids were with the nanny at co-parents. I wanted to do this for some alone time with him, and since he prefers (“thrives on”) playing with his friends. We did homework. I tested him at math for 10 minutes and he did pretty well. I quizzed him at spelling. He hit the road like a bat out of hell to play with his friends. I did some more work. Nothing eventful. I decided to pick up the rest of the kids at 4:30. I arrived at co-parents with the nanny outside doing crafts with the kids. This is good. But…. they were cranky and fighting. This is bad. They had no naps. This is really bad. And Twin Crazy has a bite mark on her arm. This is terrible. I don’t understand. How do 3 year olds have control over this woman? Are there no boundaries? Why does Twin Husky bite? I don’t see this anymore. I am angry; these kids should have slept. Now I have to deal with the cranky kids. At home I decided that resting on the couch was the answer for the kids while I wrapped up dinner. I went to the garden and picked a ton of carrots. Big Bro was in and out with his friends. We received a care package of left over vegetables for Cocoa our guinea pig from one of the neighbors. We sat down to an outrageous dinner. After dinner I quickly cleaned up. I downloaded workbooks for Red for her cutting project (she makes up projects for herself). I worked with her on the project which involved putting her cut-outs in a zip-lock bag and also her pieces of trash in a trashcan. She would hand me the paper and say “ding”. I checked email while working with her. Twin Crazy and Twin Husky were passed out immediately after dinner. I let them sleep on the couch while the rest of us were up, and then carried them into their rooms for bed. Bedtime was easy for Red and Big Bro. Red was fine because I had a lot of alone time with her and her workbook projects. Big Bro felt the need to clean up his entire room. He was proud of his work and wanted me to see it. I loved being a mom to these kids today. I loved cooking a real dinner. I felt needed by the kids. I have some work to do to prepare for some meetings tomorrow but I think I’ll be able to handle it in the AM when I get in the office, first thing. So I’m not going to work tonight. I’m going to watch some more “The Good Wife” and maybe wonder where Penny the chicken is. The kids already think she’s dead. No tears have been shed, yet. Big Bro’s pre-school is closed today and tomorrow – so I am working from home today and will take tomorrow off. Big Bro and I are right now sitting together on the couch to talk about the highlights of the morning. All kids woke up at the same time. Red wanted her hair wet but with no pony-tail. Twins were a bit cranky. I think it’s because they maybe didn’t eat enough last night? Maybe they are both very hungry. Big Bro went into a tantrum because he wanted me to find the toy scoop of “chocolate ice cream”…. NOW. I said I first needed to take a shower, but Big Bro didn’t like that answer. He decided to go back to bed. During my shower Red was putting her hand against the shower glass door and I played the game with her where I meet her had with my own on the other side. When I got out and got ready, Red wanted to help me with my face lotions. Red and I check on Big Bro. He’s still in bed sulking. While Red and I walk downstairs, we see Twin Crazy moving her body and swaying to the music in the kitchen. She loves music. And she loves to dance. Ever since she was a little baby. When she sees us, she gets embarrassed and runs over to the stairs to greet us with a HUGE hug and kisses. Twin Husky is walking around with a red balloon. I gather clothes, eventually Big Bro comes downstairs. Red requests pink shirt, pink pants, pink underwear, and orange (Halloween) socks. Twin Husky proceeds to throw all the little tiny cereals from the small kid table all over the kitchen floor. We pick them up. TIME TO GO – we drop off Red and Twins. No problems. Big Bro and I drop off Hubby at the ferry station. Big Bro and I decide to go to the “new school” to look around and see what it’s all about. We peek into the kindergarten classes but they are all locked up. We might go back later today or tomorrow in the afternoon to see if we can walk inside the rooms and get him more comfortable. 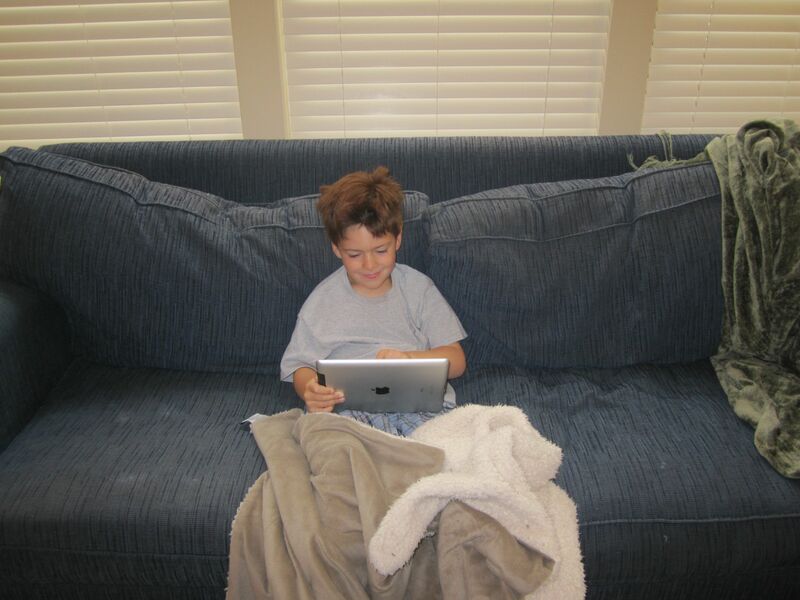 Now we’re sitting on the couch while I’m typing away on my iPad, and Big Bro is anxious to play puzzles and games. “When is it going to be my turn???”. I’m thinking about what to do today for work, and also what to make for dinner tonight, and also where we can go to lunch together. I’m looking forward to working at home today with my eldest child, Big Bro. He played games for about 45 minutes and then got extremely bored and frustrated and cranky. I decided it was time to put the games away and suggested a movie instead. He whined, I reminded him about him trying harder not to whine, then he whined a little more, then I pulled his toes to make him laugh. I offered a snack. That worked. Big Bro then started to watch “Chicken Little” which is a cute movie with actually some reasonably good music. I was busy with go-to-market stuff so I was having a great time. We went to lunch at 12:30 — right on a golf course. He polished off a huge adult plate of french toast. He can put it away. During lunch we made a list of things he needed to get for kindergarten (lunch bag, haircut) and also a list for Red (lunchbox, hair clips) for her first day at pre-school. On the way home we stopped at the food store to pick up dinner for tonight – a roast, since I have the time. During this time I got more work done and also started dinner. He’s up now, finishing the movie, while our dinner finishes cooking. We’re going to pick up Red and Twins and then go to the ferry station to pick up Hubby. It was a great working day. I loved spending time with Big Bro. I threw the cauliflower on top of the potatoes, on top of the roast and then Big Bro and I jumped in the mini-van to get the rest of the kids. Off to ferry station to watch the boat come in and get hubby. We looked at flags, saw dogs, and talked about the boat coming in and the people coming off the boat. There’s daddy!!! At home we quickly have dinner thrown on the table. Twins are very hungry. All actually ate tonight, even Red. “Listen to your body. If you are still hungry, then keep eating.” Hubby and I split one beer. Red gets changed by herself into PJs because she is hot. Twin Husky and Twin Crazy both want to spoon the meat juice on our plates. So cute. After dinner Big Bro continued his Chicken Little movie. Twins and Red were playing kitchen with me and Hubby. Then we all move to living room to watch movie. All of us were on the couch together which was really cute. Red requested peaches and all kids went nuts. They ate peaches like there was no tomorrow. Twin Crazy and Red then started acting silly. Downward dog positions, downward dog with leg in air, then Twin Husky started it too. Then lots of running around – this is what sugar does to my kids. Diaper changes – Twin Crazy was fun, kissed her toes and feet and got her in PJs. Twin Husky was atrocious. It was a very, very, bad diaper. So bad I had to get him naked and throw the diaper OUTSIDE in the garbage bin. I got him in the laundry room and washed him down. He didn’t even cry – he had to know that it was terrible. MILK! TIME TO GO UPSTAIRS!! 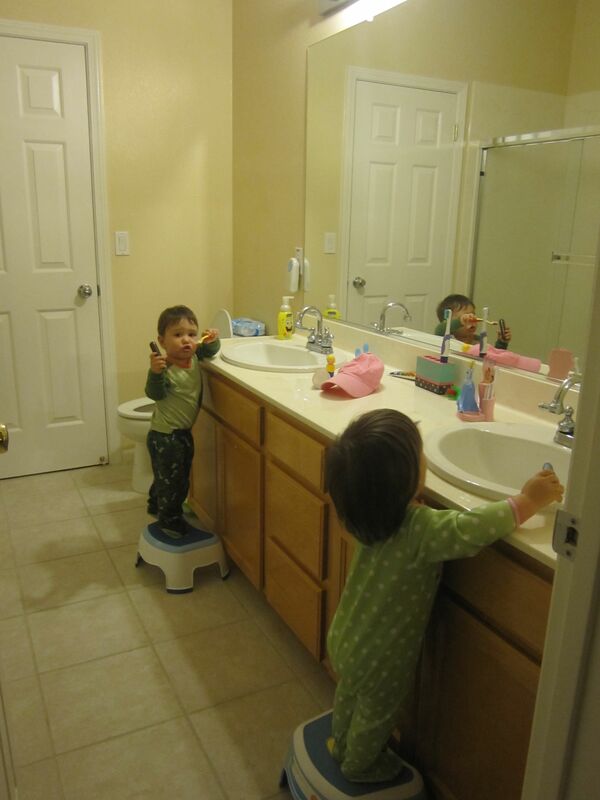 All kids are up – Twin Husky and Twin Crazy “brush” their teeth on stools. We read, sing songs, kiss. Good night!! Big Bro and Red decide they want their nails trimmed. “Oh my goodness they are so long they’re almost singing!!! Look at THIS guy!! !” I always make a big deal about their nails. I have to make a game out of it. Then I start a new game by saying how they have “stinky toes”. Both were giggling uncontrollably with that. Everyone is in bed and I had an amazing day. TRULY AMAZING. Working from home really makes a difference – and the injection of kid time today was unusual but I needed it. I think Big Bro did too – he’s anxious about Kindergarten. My dad is coming in for the weekend and he’ll be here tomorrow in the late AM. Big Bro is excited and Red is thrilled. I’m looking forward to his short visit.